The end of the financially beleagured service was unavoidable given shrinking passenger numbers, rising costs and accumulated losses. It is however a blow to Penzance with 60 employees losing their jobs and the islanders' passenger transport links to the mainland limited to just the weather dependent Skybus service in the winter months when the Scillonian does not sail. See www.frist.org.uk for Friends of Isles Scilly Transport, a campaign group supported by the community and business seeking reliiable, affordable all year round lifeline transport services for the Isles of Scilly. Thank you for your comments. I try and ensure that readers get the authoritative sources so they can form their own opinion rather than just accept my interpretation. 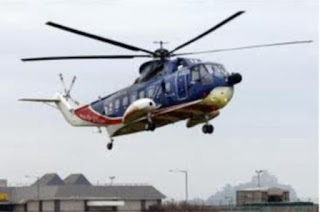 This particular news items was more of a personal account of the last helicopter arrival at Penzance Heliport. If you need more information then approach me directly (there is material that the Chamber of Commerce cannot post on this site).